On this day in the year 1809 the British army under the command of Sir John Moore fought a critical battle outside the port of La Corunna in northwest Spain. Their victory at the battle allowed the escape of the ragged remains an expeditionary force that had been pursued across Spain by Napoleon’s armies. In the late summer of 1807 Napoleon was all powerful in Europe having smashed the Austrians, Russians and Prussians in successive campaigns beginning in 1805. Now no nation dared stand aginst him except ‘perfidious Albion’ – Britain. Napoleon forced all of Europe to close their ports to British trade. One nation refused. Britain’s oldest ally – Portugal would not comply. 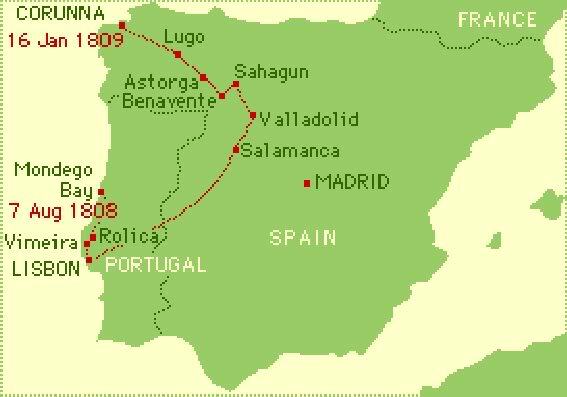 Napoleon sent an army through Spain (his ally) and into Portugal. Then he made a fatal error he deposed the Spanish king and put his own brother on the throne. All of Spain burst into rebellion. Britain sent an expeditionary force which defeated the French in Portugal whilst the Spanish destroyed a French army at Bailen and then forced the French back towards the border with France. In 1808 Napoleon now took direct action. He marched into Spain with 200,000 veterans of Austerlitz and Freidland and soon smashed the Spainish armies. At this point in time in the autumn of 1809 Sir John Moore was in command of the British. Sir Arthur Wellesley (later Wellington) was back in Britain at the time. Moore led the British into Spain – advancing to Salamanca – in attempt to cut the French supply lines and help the Spanish. Napoleon now saw his chance to crush Britain’s professional but small field army. He swung northwards and soon Moore realized that he must flee or be destroyed. What happened next was one of the more extraordinary episodes of the Peninsular war. Setting out on Christmas day 1808 Moore covered 250 miles with his army of mainly foot soldiers over the next 18 days through the most appalling winter conditions of snow and ice and through the mountains of north west Spain. The British cavalry managed to keep the French from catching up so that on 11th January they arrived at the port of La Corunna only to find that the harbour was empty. The Royal Navy has not yet arrived. The British had no alternative but to fortify the port and wait for the ships and hope the French did not arrive. Unfortunately Marshall Soult one of Napoleon’s best generals turned up with his Corps on the 15th of January. The Navy was on its way but the British had to first turn and fight once more – to keep the French at bay until they could escape. Marshall Soult came up with a simple battle plan. He would attack to pin the British left and center whilst one of his divisions under Mermet attempted to turn the British right at the village of Elvina. The attack on Elvina was a success and Mermet was soon attacking the heights beyond. Moore knew how important Elvina was so threw men that way and the possession of this village changed hands repeatedly with Moore having to commit his reserves to attempt to hold the French attack on his wing. It was during one of these engagements that he was hit by a cannonball and fell fell mortally wounded. He would take hours to die but was described as brave and composed throughout. Soult had tried desperately to break through at Elvina but the British were just able to hold on as night came. Both sides lost around 1000 men in this battle. The following day the British were able to start embarking on the ships that had now arrived. Moore’s action had saved the British army and would allow Sir Arthur Wellesley to continue the war and one day drive the French from Spain. A Bolton, a Bolton! The White Hawk!